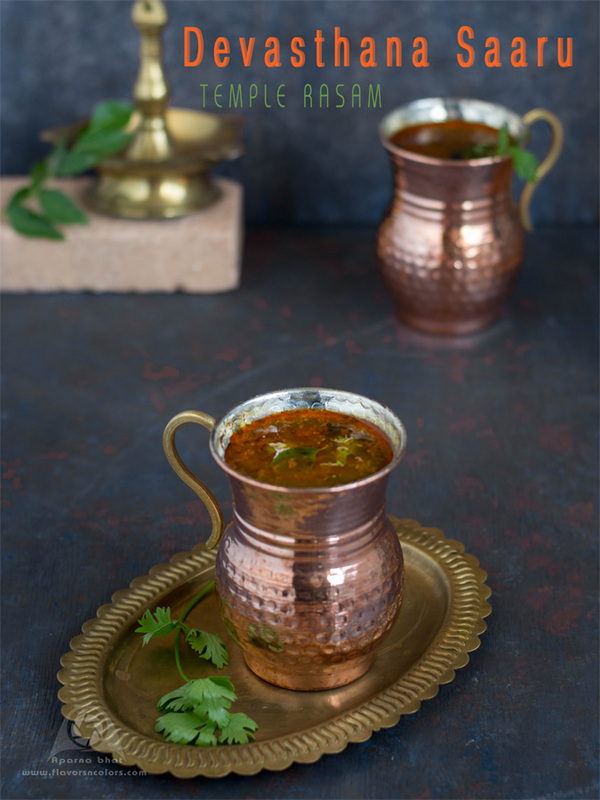 "Devasthan" is a konkani word for temples and the saaru/ rasam that is prepared in most of the temples during temple festivals and functions is called as devasthana saaru. This preparation is very tasty and has a unique flavor. You can enjoy this finger-licking saaru with hot steamed rice and papad. Roast chana dal, coriander seeds, methi seeds, cumin seeds, asafoetida, red chillies in few drops of oil one by one on low flame. Finally roast grated coconut for a minute. Switch off the flame and sprinkle some turmeric powder on it. Keep the roasted ingredients aside and allow it to cool. Wash, clean and put a cross on tomatoes. Take about 2 cups of water and blanch the tomatoes. Once cooled remove the skin and blend into puree. 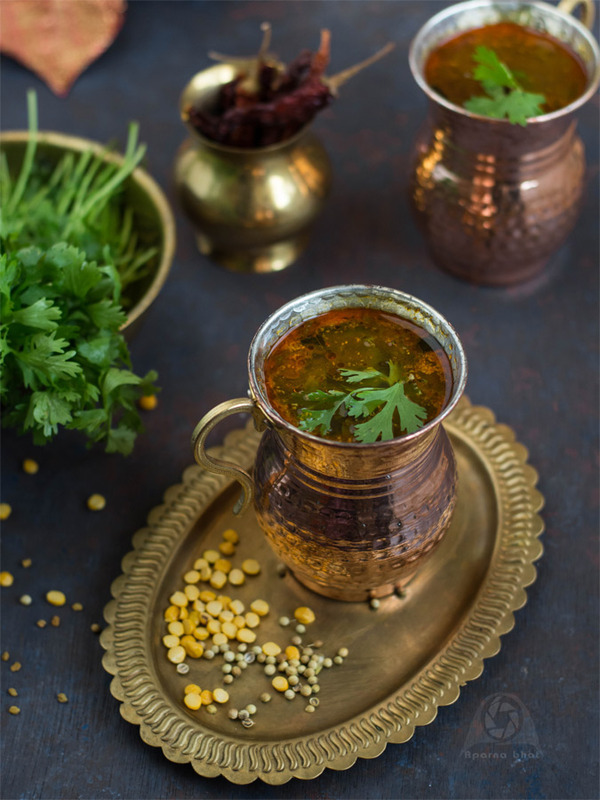 Mix the puree with salt, slit green chillies, tamarind extract, 4-5 curry leaves, chopped coriander leaves and jaggery in a vessel and place the vessel on the flame. Add ground masala and requred amount of water and continue cooking for about 5 mins. Season it with ghee, mustard seeds, curry leaves and garnish with finely chopped coriander leaves. 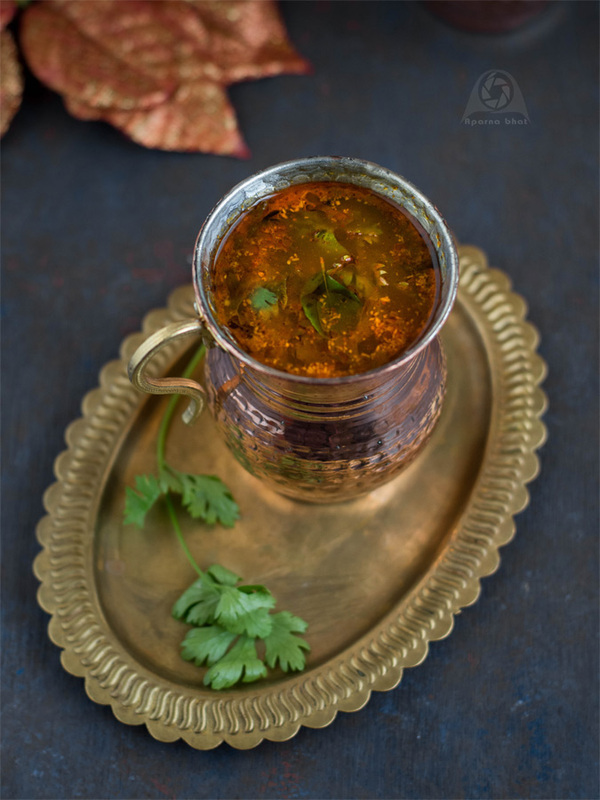 Enjoy this piping hot spicy saaru with steamed rice or just drink it like soup!